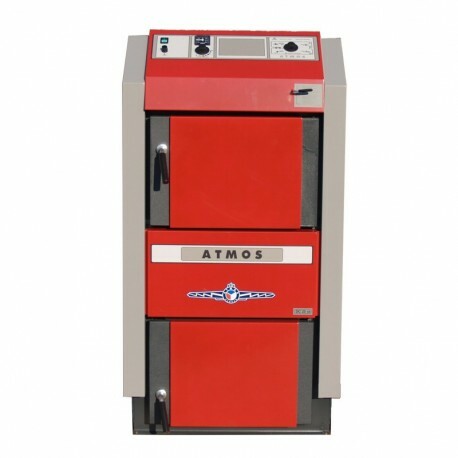 Ecological wood gasification boiler Atmos DC 50 GD (Generator Dokogen). High efficiency 92 %. Ecological burning. Operating power 49 kW. Large fuel container = large pieces of wood. High quality. 2 783,23 € tax incl. 3 479,04 € tax incl. Ecological wood gasification boilers Generator Dokogen boilers are characterized with a special chamber which is on both sides laid with special ceramic shaped parts, with primary air inlets in the lower section and with ceramic nozzle and in lower chamber with spherical ceramic parts. Rear flue duct is equipped with a tubular heat exchanger. Gasification of wood (inverse burning) with subsequent combustion of wood gas in ceramic combustion chamber ensures optimum burning of all combustible components. The air supply and combustion process are controlled with exhaust fan. This allows quick ignition and good combustion of the boiler since the firing up. The flame temperature is 1000 - 1250 °C. Inverse burning (gasification) and ceramic combustion chamber enable practically complete combustion with a minimum of harmful exhalations. The boilers meet limits of European regulations for environmental friendly product and belong to 5th class of boiler standard ČSN EN 303-5. Meet the most demanding requirements of the EU - ECODESIGN 2015/1189. Electrical - mechanical - output of the boiler is controlled with a regulating air flap operated with the draught regulator, FR 124 type, which automatically opens or closes the safety valve according to a set output temperature of water (80 - 90°C). When setting the power regulator, much attention should be paid because the regulator has another important function other than power regulation - it also secures the boiler against overheating. A controlling thermostat located on the boiler panel regulates the exhaust fan according to a set temperature (80 - 85°C). A temperature lower by 5°C should be set on the controlling thermostat rather than on the FR 124 draught regulator. Boilers are also equipped with the waste gas thermostat which serves to switch off the exhaust fan after the wood burns out. The boiler runs at a reduced output even without a fan - heating is not lost when the electric power fails. At up to 70 % of its rated output, the boiler can be operated without a ventilator.